Police worked at the scene of Monday’s bombing in Bangkok. BANGKOK — In the grainy security video, a man in a yellow shirt sits on a bench at the crowded Erawan Shrine, removes a backpack he is wearing, and leaves it behind when he walks away. For police hunting who was responsible for Monday’s deadly bombing in central Bangkok, there was no doubt about the man with youthful, shaggy dark hair and glasses. ‘‘The yellow shirt guy is not just the suspect. He is the bomber,’’ police spokesman Lieutenant General Prawut Thavornsiri said Tuesday. Prime Minister Prayuth Chan-ocha called the shrine bombing near a busy intersection that killed 20 and wounded more than 100 ‘‘the worst incident that has ever happened in Thailand,’’ and he promised to track down those responsible. Bangkok was rattled again Tuesday when another pipe bomb blew up at the Sathorn Pier, which is used by tourists, although no one was hurt. 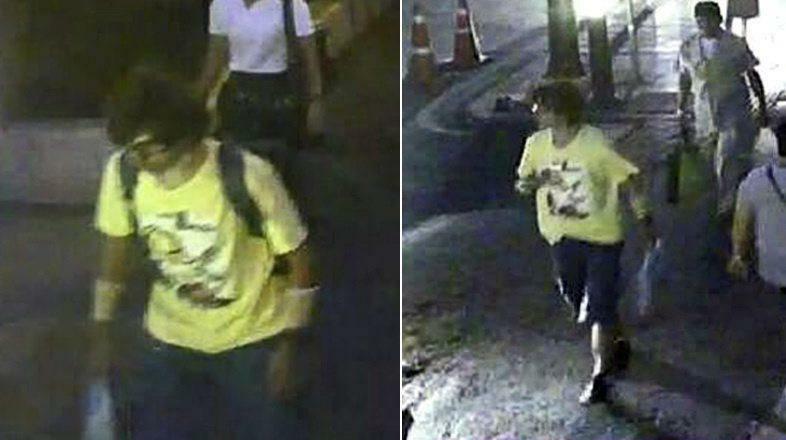 Prawut released several photos of the man, with and without the backpack, on social media. The images were apparently taken from closed-circuit video at the shrine before the bomb exploded. Video posted separately on Thai media appeared to show the same man sitting on a bench at the shrine, taking off the backpack and leaving it behind as he walked away. The bomb, which police say was made from a pipe and weighed more than 6 pounds, went off about 7 p.m. in an upscale area filled with tourists, office workers, and shoppers. No one has claimed responsibility. Prawut said Tuesday’s blast at the Sathorn Pier also was caused by a pipe bomb and could be related to the shrine attack. Police said the bomb was thrown from the Taksin Bridge and fell into the Chao Phraya River, where it exploded. Security video showed a sudden blast of water over a walkway at the pier as bystanders ran for safety. The Erawan Shrine is dedicated to the Hindu god Brahma, but is extremely popular among Thailand’s Buddhists as well as Chinese tourists. Although Thailand is predominantly Buddhist, it has enormous Hindu influence on its religious practices and language. Thai authorities identified five victims as Thai and four as Chinese — two of them from Hong Kong — along with two Malaysians and one Singaporean, and said the nationalities of the other eight victims remained unknown. The British Foreign Office said one victim was a British citizen named Vivian Chan who lived in Hong Kong. It was not immediately clear whether she was one of the two Hong Kong victims identified by Thai officials. Officials at London’s BPP University said she had studied there. 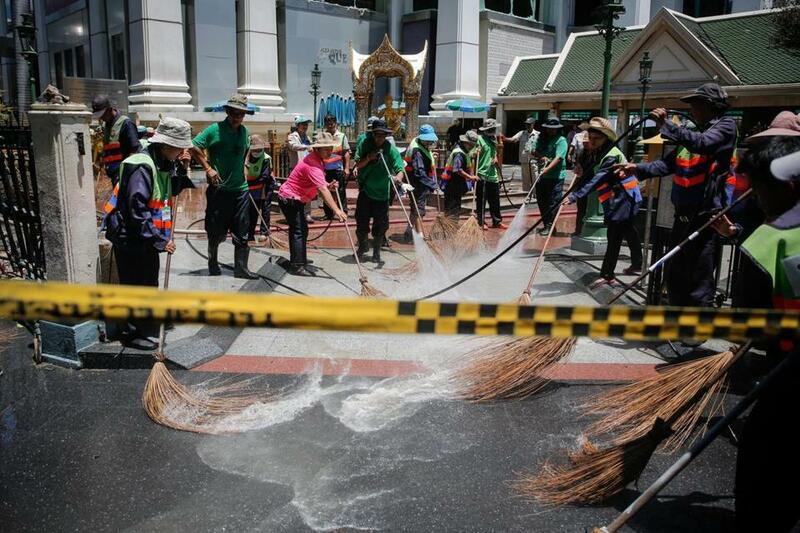 Defense Minister Prawit Wongsuwan said authorities had no idea an attack had been planned. ‘‘We didn’t know about this ahead of time. We had no intelligence on this attack,’’ he said. Prayuth vowed to ‘‘hurry and find the bombers,’’ though he noted there may be just one perpetrator. Speaking to reporters, he continued what has been a notoriously prickly relationship with the media since the former general took control in a May 2014 coup that ousted a civilian government. In Washington, State Department spokesman John Kirby said the United States is offering to support Thailand in its investigation but has not received a request. He said there was no indication that any Americans were among the casualties. Matthew Wheeler, Southeast Asia security analyst for the International Crisis Group, said the bombing was a ‘‘new type of attack for Bangkok’’ that doesn’t bear the marks of typical violence in the past decade from political instability or separatists.